If you have purchased the Early Finisher Board and are currently using it, or if you are considering purchasing it, you may have a few questions. Please skim the FAQ’s below to read about some of the most common questions. The answers are a based on a combination of my own recommendations, as well as the experiences of teachers from around the world currently using The Early Finisher Board in their classrooms. But before you do ANYTHING, please join our Early Finisher Board private Facebook Group! This is the place to go for inspiration, ideas, and tips for your own Early Finisher or Math Choice Board! Q: How can the activities be appropriate for Grades 2-4? A: These activities are designed to appeal to a wide variety of skill levels. Many of the questions are open-ended, allowing students to work to their own potential. Depending on the grade that you teach, you may set specific expectations. For example, 2nd Grade students might only write two simple sentences for the journal prompts, but 4th Grade students might write five sentences, using at least three vivid describing words. Additionally, many of the tasks include an “Extra Challenge.” This ensures that those students requiring the extra challenge can complete it, while those who are challenged by the original task can skip the extra challenge portion. Q: I teach 4th – which package should I purchase? A: If your class consists of students who are mostly at grade level, with a few below and above, the Grades 2-4 version should be appropriate. If your group includes many students who are above grade level, you may consider using the Grades 5-6 version instead. Another great option is to purchase the Combo Pack for only a few dollars more than the Complete 40 Weeks. This way you can pick and choose the activities that best-suit your class, allowing even more differentiation. If you ever change grade levels, the Combo Pack may come in handy as well! Q: How can I modify The Early Finisher Board so that it better suits my classroom? A: The tri-fold board will not work for everyone. 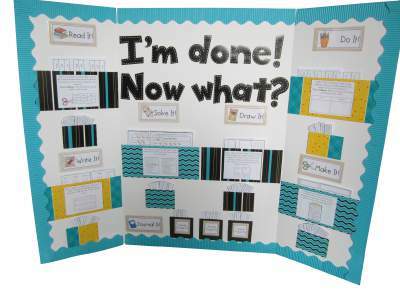 For this reason, teachers have implemented bulletin boards, binders, bins, and even portable folder systems for their Early Finisher Boards. The results are really amazing! You can view some specific examples HERE. Q: How else can I use the Early Finisher Board in my classroom? A: The Early Finisher Board is great for early finishers, but it is also a solution to other common classroom problems! What do your students do when they enter the classroom in the morning? The Early Finisher Board makes great morning work as well! I have heard from other teachers who use it as a Math/Literacy work station, and still others who use it as a whole-class brain warm up before learning something new. The possibilities are endless! Q: How do I assess the activities that students complete from The Early Finisher Board? A: Quite honestly, I do not recommend assessing every piece of work that your students do from the Early Finisher Board. Remember that these are simply extra activities to provide reinforcement of previously learned skills and to eliminate classroom management issues when students have finished their work. If you try to assess every single activity, you will drive yourself crazy, and use up valuable time that you could be planning more wonderful lessons for your classroom! That being said, you will probably want to somehow monitor the activities that students are doing. There are a couple of options for this. Many teachers choose to simply skim the activities when they have time. You might leave a sticker, or a small comment to show students that you have looked at their work. I do not recommend having students re-do their work if you see mistakes (unless you feel very strongly about this). Keep it fun! It’s just practice! Other teachers like to have students share their work in small groups, which is always popular! Students can gather in groups of three or four and share what they have been doing in their Early Finisher notebooks. This might also be a good time to allow them to work a bit more on some of the activities in a peer setting. Some teachers also tend to monitor the Early Finisher Activities more at the beginning of the year as routines are being established. Later in the year, this may become unnecessary as students become self-managed. Q: How can I manage set-up and maintenance of The Early Finisher Board? Take a couple of days during the summer or on a weekend to get all of the Early Finisher Activities prepared. Store them in re-sealable, labeled bags. This will eliminate the need to prepare throughout the year and save you valuable time! Ensure that you laminate and take good care of the materials. This way they will be ready to go for next year! As long as you keep the materials in good condition, year two and beyond will take much less time. Some other teachers only switch the activities every three weeks. This will depend on how much your students use the board. Q: How can I keep my students motivated? When you talk about the board with your students, are you excited about it? Remember that excitement is contagious! When students finish their work, act like it is a big deal that they “GET” to go to the board (not “HAVE” to)! Do you allow your students complete freedom to choose the tasks that they want to complete? Students will be more motivated when they have the power to choose. Are you switching the activities every two weeks? This will prevent boredom with the same tasks. Are you marking/grading the tasks that they complete? If you are, stop. View the activities as fun practice and reinforcement, not an assessment tool. Even if you don’t assess the tasks, students will benefit from the extra practice. Do the students experience success with the tasks? If the tasks are too hard, students won’t enjoy it. With this board, it is better to keep the tasks too easy than too hard. This will ensure that independence is possible. If you are using the Grades 5-6 Board, try using the Grades 2-4 version. If you are using the Grades 2-4 version, try using some of the easier activities from the Supplementary Package. Do you allow your students to work with their peers on the activities? Try allowing students to work in small groups or partners, even if they are not working on the same activity. Allow them to chat quietly as long as they are working. Some teachers like to implement a Friday “Reward” period where all students get to work on the board for a period. Q: Are there any add-ons for The Early Finisher Board? A: Yes! Right now there is a Halloween and a Christmas add-on for the Early Finisher Board. These add-ons include a range of activities for the board for the weeks surrounding the holiday. The seasonal packages are appropriate for Grades 2-6, as they provide several different activities for each section. You are able to choose the difficulty level that best suits your classroom. Q: What if my students rush through their work to get to The Early Finisher Board activities? Q: What if some of my students never get to use it? A: We all have those students who are never the “early finisher” and who may never get to use the Early Finisher Board. A few teachers have shared with me that they use one period on Fridays as a “reward period” where all students get to work on activities from the Early Finisher Board. Others implement “free time” throughout the week where all students can work from the board. Another teacher shared that she allows students to take the activities home to work on. Another teachers uses the Early Finisher Board as a center activity while she meets withe small Guided Reading Groups, so that everyone gets to use it. Do you have a question about The Early Finisher Board that was not addressed here? Or would you like to show me what you’ve done with your Early Finisher Board? Feel free to get in touch with me through this website, or through my Facebook page! I love to hear from you!